Campaign to oppose Thames bridges at Gallions Reach and Belvedere –we may just have a victory! BARC is a local community group formed in opposition to the building of large ‘road’ bridges planned in South-East London. 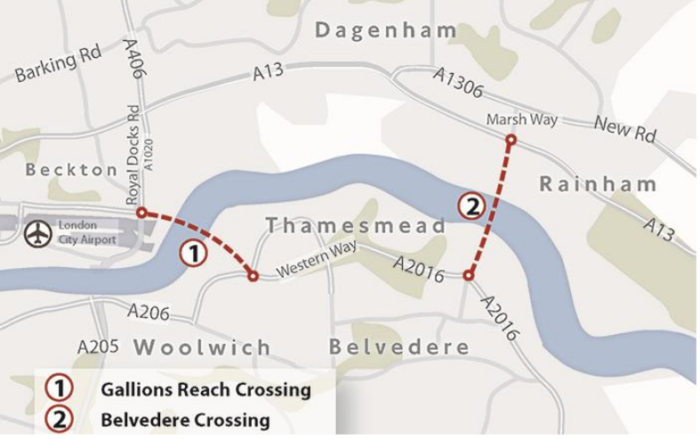 In 2015 Transport for London (TfL) and Bexley Council wanted to build new tolled road bridges across the Thames at Gallions Reach and Belvedere – two large residential areas in South-East London. These were not intended to be ‘cozy’ little crossings for local traffic: the Belvedere bridge was to be 4 lanes and more akin to an urban motorway than a picturesque route across the Thames. An additional bridge was also planned a short distance away at the Gallions Reach crossing. Both crossings were to be linked to trunk roads by large roundabouts or motorway-style junctions in such a way that long distance traffic from Kent – including HGVs – would be encouraged to pass through densely populated areas of Bexley, Belvedere and Thamesmead to cross the Thames. In addition, the local traffic intending to use the bridges were set to exasperate the problem still further by adding to the congestion and air pollution on many adjoining roads. Moreover, throughout the period of consultation there remained no proposals as to how these local roads would accommodate the extra traffic. BARC campaigned and submitted a number of consultation documents to TfL over the following two years explaining the reasons for our opposition to the ‘road’ crossings. Much of the resistance to these plans was on the grounds of air pollution, congestion and the removal of much needed public housing . Our alternative plans consisted of advocating the use of public transport crossings, including the extension of the DLR to Thamesmead and Bexleyheath, and further links to the existing CrossRail. Yet, throughout this period TfL appeared to remain in favour of the large road bridges, seeing them as an integral part of their ‘visionary’ concrete and tarmac-led ‘Growth’ agenda. 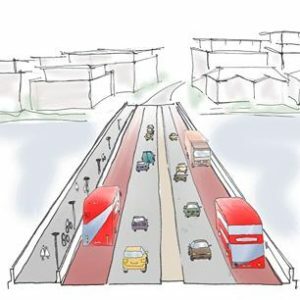 It was therefore a great surprise to us active in BARC – after submitting a response to Mayor Sadiq Khan’s Clean Air for London Campaign – that we found the plans for the ‘road’ bridges appeared (for now at least ) to be abandoned and the much needed DLR to be extended to Thamesmead and probably Bexley. We are however not complacent – as we have had to stop ‘road’ bridges many times in this area – but for now we feel confident enough to re-constitute our group as an organisation dedicated to stopping toxic air pollution in this region.